I wrote a version of this post two years ago during the Hurricane Joaquin, which, as it turns out in hindsight, was also the date of my own personal unnatural disaster. It’s still one of the most tragic and AVOIDABLE disasters in maritime history. We now know that everyone was lost at sea. 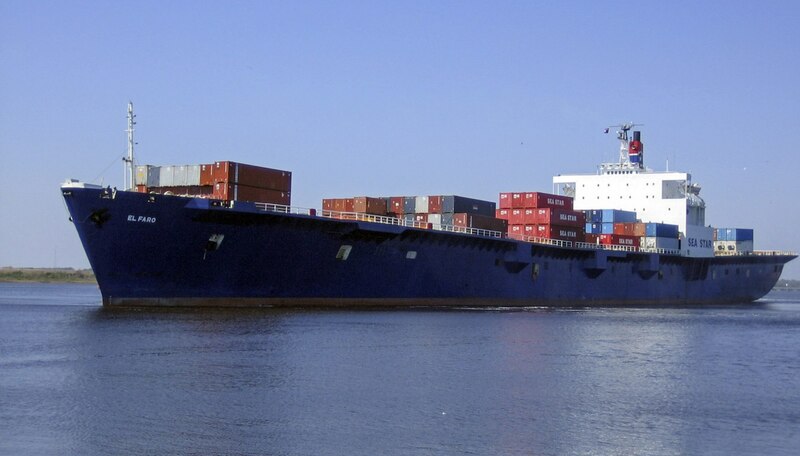 The El Faro was on a regular run from Jacksonville to Puerto Rico. “A stricken cargo ship with 28 Americans on board that vanished during Hurricane Joaquin remained missing early Saturday. It could be 1815 or 1915, but in 2015, ships still go missing and are at the mercy of the elements. Even with advanced communications technology and state-of-the-art equipment, Mother Nature reigns supreme. The terror of being lost at sea is all too real and always somewhere in the back of our minds. Our hearts go out to the crew and their families. This entry was posted in All Posts, Serious stuff and tagged El Faro, Hurricane Joaquin, Jacksonville, Lost at sea, Maritime disaster, Merchant Marine, Missing cargo ship, Puerto Rico, TOTE maritime by Enchanted Seashells by Princess Rosebud. Bookmark the permalink. Oh I wish he were with you too, but he is a mariner. I don’t think of boats sinking in this day and age but I read something the other day that the number of losses is huge. You are a brave woman. Prayers and hugs for your man and all others who are out there and for those lost. Thank you so much. It’s comforting to know there is satellite email but even that goes down sometimes but he knows I worry and will call on the boat phone if it’s out more than a day or two, but if they lost all communication, it would be very scary for sure. The life of a seafarer and his family is not for the faint of heart! My thought are with them as well! That storm is huge, I can not imagine a ship being in the midst of it. Hub’s been in some big storms, but nothing like this; with no propulsion, they couldn’t even maneuver away from it. So sad. So, you are expecting the worst? I thank you for taking the time to give me this answer. I sure can see the reason for worry and glad that you have some communication. I too can’t imagine a ship in the middle of that storm. My thoughts are with you! I hope they find them safe and sound! I hope the crew is able to survive the disaster and the storm. I hope your tugboat man, and all the brave men and women who work to keep this planet fed, clothed and pampered, are all safe and well tonight. I can’t even imagine how awful it is. I know. I mean, I don’t really know, because I can only imagine, and that’s pretty bad. How’s your weather? Hub/son upset they’re not there for hurricane surf. I swear, boys never grow up. That sounds scary! My brother, for a while, was thinking of getting a job on a crab boat, which is said to be one of the more dangerous jobs. I was pretty glad when he forgot about it! I’ve heard that too, it’s a very dangerous job on a fishing boat, maybe less so on a tug. Oh man, this is scary. The poor families.